The IRS is reminding employers to act soon if they plan to claim a Work Opportunity Tax Credit (WOTC) for hiring certain military veterans. The expanded credit may provide thousands of dollars of benefit to qualified businesses, but only if they hire veterans before the end of 2012. The WOTC rewards employers with a tax credit for hiring individuals from targeted groups. The Three Percent Withholding Repeal and Job Creation Act (2011 Heroes Act) expanded this tax incentive to encourage employers to hire military veterans by creating the Returning Heroes Tax Credit and the Wounded Warriors Tax Credit. The amount of the credit depends on a number of factors. Such factors include the length of the veteran’s unemployment before being hired, the number of hours the veteran works and the amount of wages the veteran receives during the first year of employment. 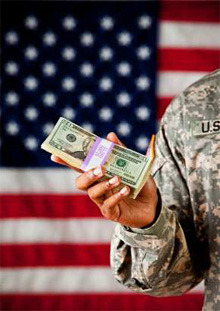 The Returning Heroes Tax Credit and the Wounded Warriors Tax Credit apply to individuals who begin work after November 21, 2011, but these credits are scheduled to expire after December 31, 2012. In order to qualify, employers must file Form 8850, Pre-Screening Notice and Certification Request for the Work Opportunity Credit, with their state workforce agency. The form must be filed within 28 days after the qualified veteran starts work. Some states accept Form 8850 electronically. Our office can help you get the most out of this tax benefit, but you have to act soon. Please call our office at your earliest convenience.